High-quality automotive wipes can make your garage cleaner and safer. Does that sound like an overly dramatic statement? Well, just remember that the next time you clean up a pool of antifreeze or transmission oil, and the cloth drips all the way to the bin. And one of the other mechanics steps in it and tracks it across the floor. Who is going to clean up THAT mess? The icing on the cake is that those towels have to be laundered! Don’t waste any more time on those rough, non-absorbent rags. Try OMNIWIPES! These automotive wipes come in bundles of 50, and take up a lot less room than a bag of rags. One of these white car cloths will soak up far more fluids without smearing than several shop rags. Many mechanics have already made the switch and are using OMNIWIPES instead of rags. One of the problems with automotive work is the different viscosities of the fluids used in vehicles. Antifreeze is more fluid than motor oil, which is more fluid than wheel bearing grease. Some of these fluids are quite caustic, such as brake fluid. OMNIWIPES have a 90% viscosity rating, meaning that it will actually absorb even the thickest of gels, grease, and fluids. Not only that, the cloth will retain the fluid and keep it from spreading. The last thing you want is for your mechanics to track oil and grease into a customer’s car. And, Omniwipes are affordable enough that you can simply throw them away when they get worn out or saturated. 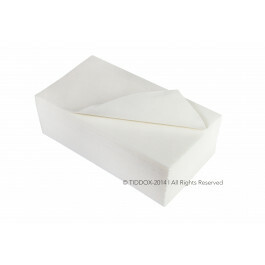 Other related products from TIDDOX's automotive range of cleaning wipes are the RAG-ON-A-ROLL, the WHITE RHINO WIPES-ON-A-ROLL, and the AUTOMOTIVE SHAMMY WASH CLOTH.